This was Lorraine's first official sketch--you can see it here. It was an easy one for me, for some reason! I usually struggle, and have to do 3 or 4 trial cards before I come up with anything worthy of posting. But, this was my first attempt! I'm not sure about the blue circle on the flower, but decided to leave it--what do you think? Ink: Rose Red to dye the flower, and Basic Black. I know it's not a "normal" graduation card, but I liked it!!! 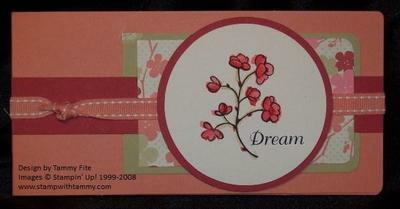 I used the Embrace Life stamp set--LOVE it!!! and, I used our new RUB ONS!!! Oh my goodness--these are so cool!!! I used the "Dream" rubon. What a perfect accent, don't ya think?! Other stuff used: Ginger Blossom designer paper, Groovy Guava Long Note, Watercolor Paper, River Rock and Ruby Red cardstock. I stamped with the Black Stazon ink pad, then watercolored with my aquapainter!! Fairly simple, but I'm happy with the outcome!! Hi!! Over the next few days, I'd like to share with you some of the wonderful hand-stamped cards I received this year for the Holidays!! The first is by my friend, Anne--don't you love these colors?! Anne used the Snowburst Stamp set, and Pretty in PInk and Choc Chip!! I love it!!! 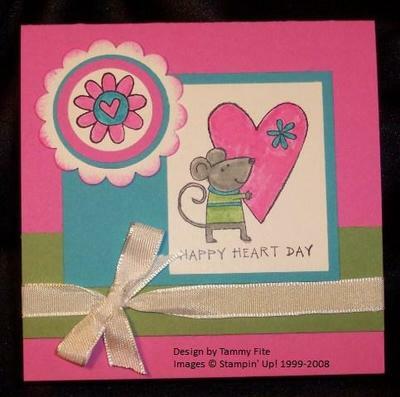 I used the "Happy Heart" stamp set (can be ordered on Jan 2--and it's included in the Valentine's Bundle!! Email me for details!). Misc: White ribbon, 1", 1 1/4", 1 3/8" & Scallop circle punches!! P.S. If you're a demo, go join SUDSOL, and tell them I sent you! Look what came in the mail yesterday!! 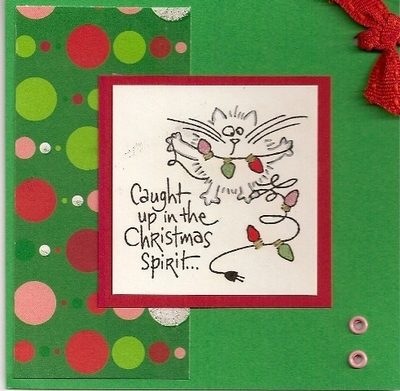 A card from Allison, in Canada!! She has a great blog, that I read daily!! You can see it here. Her blog is a GREAT resource--new tutorials, new blogs, new sketches! I'm not sure how she keeps up with it all, but I sure am glad she does! Thanks, Allison, for the great card!! Only a few more days to get any retired stamp sets or accessories!! All orders must be placed by December 31, 2007. You can view the updated Retiring Accessories list to the right. As for the retired stamp sets--get them while you can!! And, now through December 31, if you purchase 3 stamp sets on the retired list, you can get a fourth FREE!!! (the least expensive set will be the free set!). Just contact me with your order!!! No actual stamping though!! Well, I did stamp "Thank You" on the inside using the Much Appreciated stamp set. Card base is Whisper White. I used Real Red and Bashful Blue as well. The ribbon is Red Gingham. I also used one of my non-Stampin' Up! tools--the Cuttlebug!! 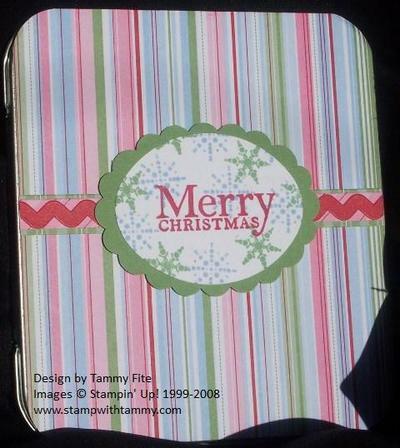 As many of you know, I just don't use too many things that aren't available through Stampin' Up! The crop-a-dile was one--and now we have it in the catalog!! woohoo!! The Cuttlebug is another--it's alot of fun to use!! Hi! I finally went through all my stamp sets, and you can see a list of the sets I have from the Fall-Winter Collection by clicking on the link to the right. (under the picture of my boys!!). These are available for reservations right now, and will be sold after January 2, 2008. Hi! I know I said I was taking some time off, but I made this tin for my neighbors on Christmas Eve, and just had to share it with you!! I love the way it turned out!! 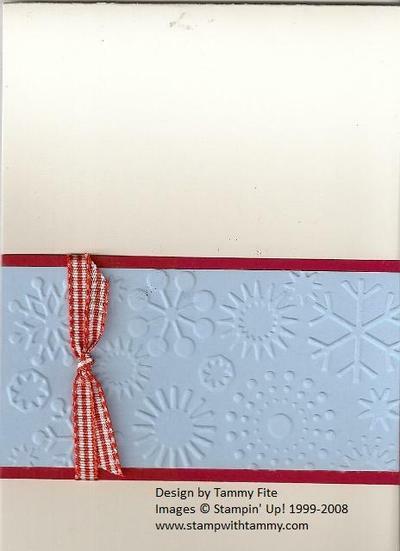 There is very little stamping involved--just the sentiment and snowflakes on the front!! 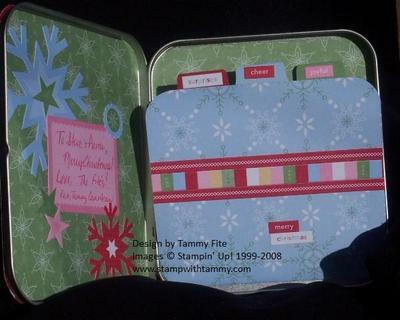 The rest is done with the Winter Bright Simply Scrappin' Kit--I sure will miss it when it's gone!!! This is the front of the tin. 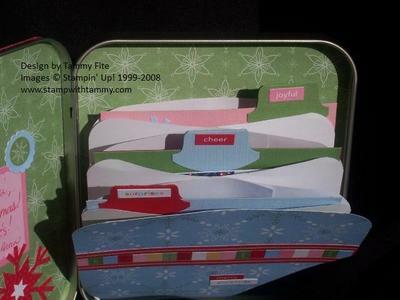 Here is the inside of the tin. 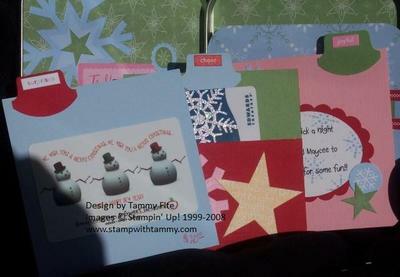 Here are the three inserts--each has a gift card or coupon for a fun night out. And, the last shot--this shows how I put the three envelopes together to made the accordian file! I was so happy with the way this turned out!! So much more fun to give gift cards when the packaging is so much fun!! I wanted to wish you all a very Merry Christmas and Happy New Year!!! I hope all you holiday wishes come true!!! I am taking a few days off to enjoy my family! I hope you're doing the same!!! I'll see you in the new year! !